White House officials are reportedly concerned about the living arrangement of Scott Pruitt, the Environmental Protection Agency chief. Pruitt was found to be paying $US50 a night to stay in an apartment owned by a Washington lobbyist. The EPA’s ethics official said the arrangement was fine because Pruitt was paying rent. White House officials are “dismayed” over questions surrounding Environmental Protection Agency Administrator Scott Pruitt’s living arrangement, Bloomberg reported Friday. Pruitt’s Washington, DC, apartment is owned by a lobbyist friend, and his lease allowed him to pay $US50 a night for a single bedroom – a bargain for the DC area. Bloomberg reported that Pruitt was initially unable to provide documents regarding his lease and payments he made to the lobbyist, three administration officials told the publication. His landlord eventually provided EPA officials with the lease and proof of payments Pruitt made. These questions follow previous concerns about tripsPruitt took, including one in which he spent more than $US120,000 in taxpayer money on a trip to Italy that included meeting G-7 ministers and visiting the Vatican. More than $US90,000 was spent on food, hotels, airfare, and a military jet used by Pruitt and his staff. Similar travel practices led Health and Human Services Secretary Tom Price to resign late last year. Treasury Secretary Steven Mnuchin and Interior Secretary Ryan Zinke have also come under scrutiny for some of their spending practices. 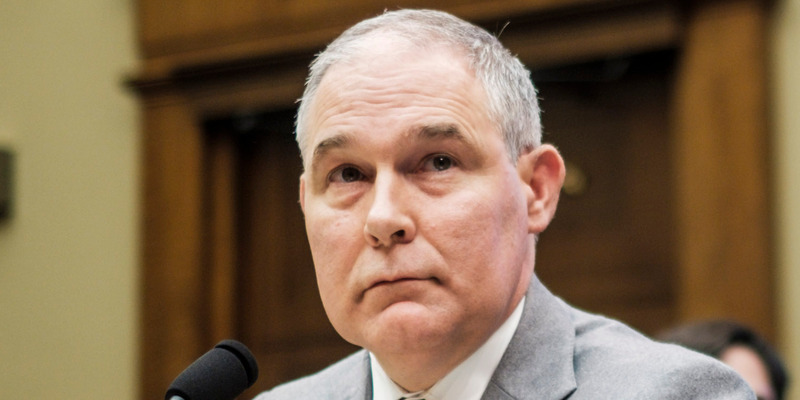 Bloomberg found that Pruitt paid $US6,100 over six months to stay in the single room in a two-bedroom apartment, paying only for nights he slept in the unit. The apartment owner is Vicki Hart, a healthcare lobbyist whose husband, J. Steven Hart, is a lobbyist whose firm represents clients who have a stake in the EPA’s regulatory measure. The EPA’s ethics counsel Justina Fugh, who has been at the position for a dozen years, told Bloomberg that the arrangement was a nonissue because Pruitt paid rent.